Thermometers are especially helpful if you’re fundraising on a deadline and want to have a way to get that across to your supporters. 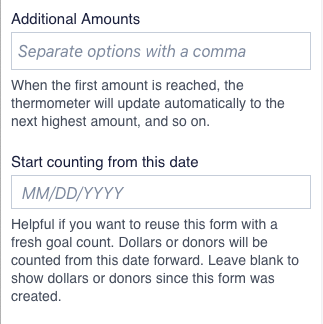 To create a fundraising thermometer, open your form. Click the "Edit" button, the first button on the form navigation bar (form navbar), to open the form editor. 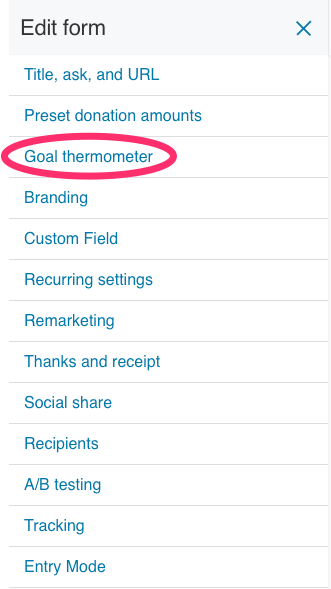 Open the "Goal thermometer" tab. Then click the blue "Create a goal" button. Decide if you want your goal to be a dollar amount or number of contributors, and then enter your goal number in the Amount field. 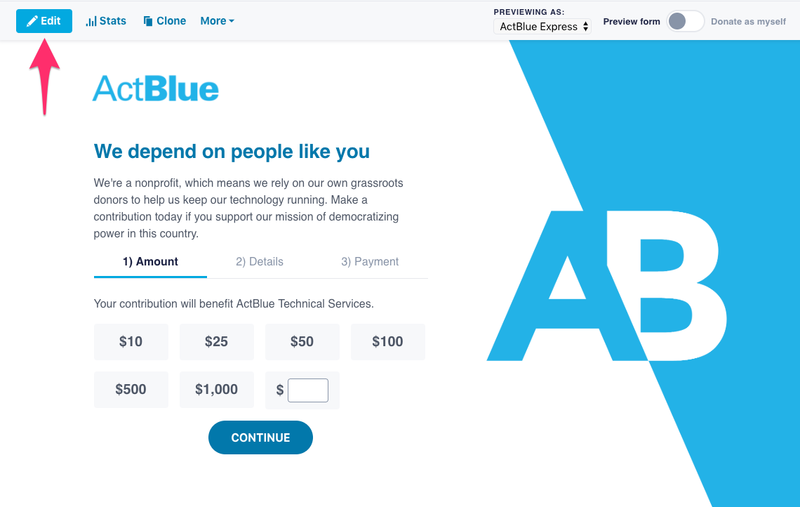 Make sure your goal is reasonable — a $1 million goal for a very small campaign or organization won’t compel supporters to donate. People want to help you hit a real and tangible target. 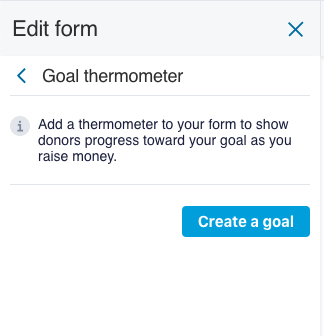 You can also choose some additional goals, so that when you hit your initial goal, your thermometer will automatically update with a new and higher goal. Enter these in order, separated by commas with no spaces in between. If you don’t enter the values correctly, your thermometer won’t update automatically. You also have the option to set a start date for your goal. Make sure you publish all of your changes by clicking the green "Publish" button or they won't be saved. 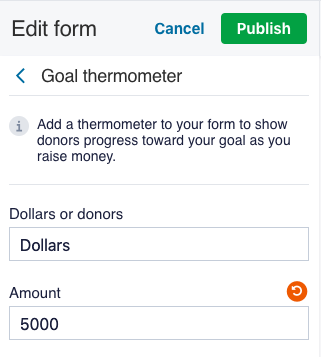 To add your thermometer to your website or fundraising emails you will need to leave your form and go back to the Dashboard. Go to the Form Management tab (if you're still in the form editor, close it and click on "View all forms" to get here) and click the "Edit" button next to your form's name. In the Form Tools menu that will appear on the left, select the Promote or Goal tab. Then click “Get Code” underneath the thermometer (either blue or white) that you want. The code will automatically contain a link to your contribution form, with the refcode “thermometer.” You can change that refcode to anything you would like. This will help your team determine just how much money your thermometer is generating. Copy and paste the the thermometer code into your mass mailer or web design software. You may need to use some additional HTML tags to achieve the desired placement. Visit our guide for some background on using HTML. 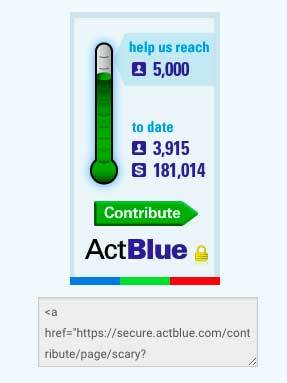 The image will automatically update when supporters open an email or form with the thermometer. Please note that if you’re not seeing your thermometer updating on your website or forms, it’s most likely due to simple caching issues with your browser. Just clear your cookies, and you should be good to go!